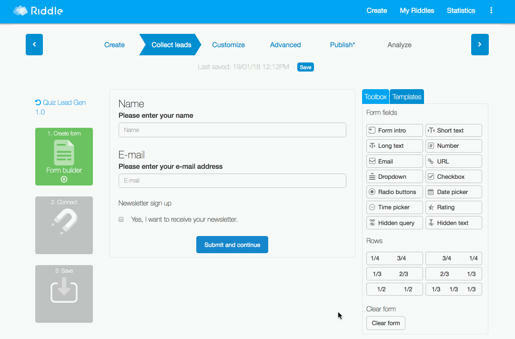 We designed Riddle as an easy to use, super powerful quiz marketing platform. With Quiz Lead Generation 2.0 – you can collect emails and quiz responses, then automatically send them to your email marketing tool. Map your Riddle form fields to your list fields in your software. You can also connect your email tools using Zapier or our webhook. And of course, any questions – please just ask us at hello@riddle.com or via support chat.